Two toilets with showers, one has a washing machine. Available from 1st June until 30 September. On the higher level (main entrance), there is the main sitting area with DVD player, small CD player and a large balcony overlooking Agni bay and Albania. A small dining room is located next to the kitchens, on the middle level. DVDs/CDs are not provided. On the middle level you will find the main kithcne with cooking oven, 4 rings & sitting area. A second smaller kithcen is located next to it with microwave, preparation area, full fridge/freezer & recycling point. Notes on accommodation: A few books are available. Binoculars. Air-conditioning unit available at the top level (included in your price). Outside: The house offers 3 levels of terraces, where you can enjoy the sun or shade depending on the time of day. Large patio with sitting/dining area and barbeque on the kitchen level. Small private pool (6m x 3m & depth 80cm to 1.6m). Other: Large terrace with sitting area and barbeque. 400m walk from Agni Bay (hilly, 1km by car). Distance from airport - 22km. Distance from Corfu town – 22km. 250m to nearest mini-market in Loustri. 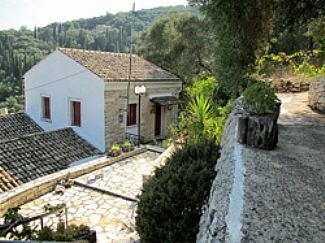 3km from Nissaki (nearest petrol station, restaurants, markets). 3km from Kalami (tavernas, markets). 4.5km from Sinies (market & bakers). 3 Greek tavernas in Agni, numerous in Kalami, Nissaki and the North East. Supermarkets (in Gimari, Kalami, on the way to Kassiopi & Nissaki). Cash points & foreign exchange in Kassiopi. Internet access in Kalami & Nissaki Hotel. Souvenir shops and other shopping in Kalami, Nissaki & Kassiopi. Car and bike hire in Kalami.